As much as love writing with a fountain pen, it’s not always the right tool for the job. For jotting random notes, you’re better off with something you don’t have to uncap. 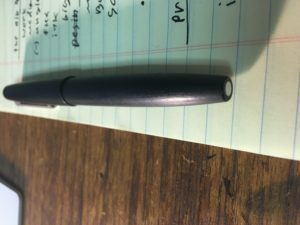 Obviously the Pilot Vanishing Point can do that, but its price kind of rules it out as the pocket pen that might end up in the wash.
Something about note taking or making grocery lists with a fountain pen feels like a slight to the instrument. Part of the fun of fountain pens is the ritual aspect. It’s nice to have a pen that’s just for long form writing. That said, my fountain pen habit has raised my standards for what writing should feel like. I don’t have to use a fountain pen, but I can’t settle for any old pen. Fortunately, I don’t have to settle. There are some excellent jotters out there that are cheap, easy to find, and smooth. here are my favorites. The current go-to in my pen cup and the #1 pen on Amazon, the Pilot G2 excels at being average and dependable. This is the Honda Civic option. It’s reliable, everyone has one, and for those of us who move on to something nicer, this was often our first experience of a good pen. I like it because it’s everywhere. This is the best pen you can buy at Rite-Aid or Walgreens. It’s cheap, and you’ll lose it before it runs out of ink. 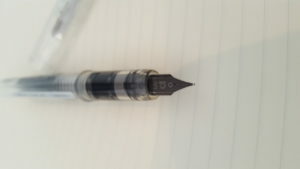 There are smoother pens out there, even in the disposable category, but what brings me back to the Pilot again and again is its wide availability. For a look at its downsides, check out Office Supply Geek. 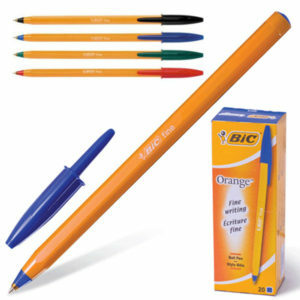 Like Bic lighters, Bic pens are classics of functional thrift that outclass everything in their price range and many above it. They’re made insanely well and priced ludicrously cheap. 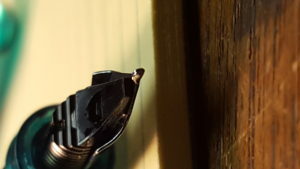 The Cristal and Orange Ball models have hexagonal barrels rather than round ones which make them more comfortable to grip than the round Bics, that is until you get writer’s cramp anyway because, after all, you’re writing with a ball point pen. Bic claims their ball points contain enough ink to lay down 2km worth of ink. But that doesn’t matter, because you’ll never be attached enough to a single Bic to do that much writing with it. At around $5 for a pack of 20, these cost $0.25 apiece. Or the Jason Bourne option… The Zebra’s barrel is made of solid steel, so it’s indestructible. This pen could save your life. It can be used to punch out glass to escape a wrecked or sinking car or as a last-ditch self defense weapon. But it’s also available wherever cheap pens are sold. This recommendation comes from retired commando Clint Emerson’s book, 100 Deadly Skills. 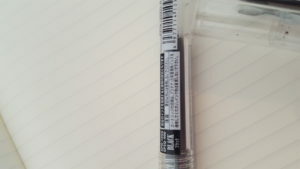 Japan’s Uni-ball makes a line of inexpensive gel pens, some of which are widely available in the States, all of which are a joy to write with. If you’re not into fountain pens, but want a smooth writing experience, look no further. I like the Signo because it clicks open and makes for a great pocket pen, but for some reason, the UM151 and the Vision tend to write better and feel more substantial in the hand. 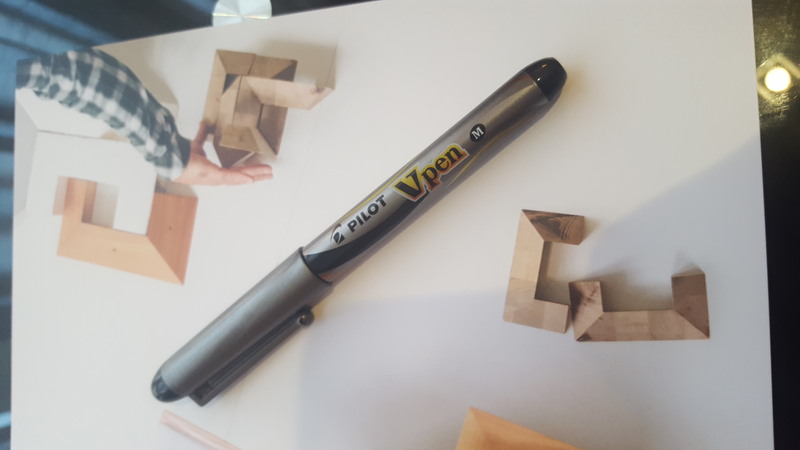 According to JetPen’s Comprehensive Guide to Uni-Ball, these pens owe their smoothness to an edgeless tip with rounded corners where the rolling ball meets the housing at the tip of the pen. The result is zero scratchiness no matter what angle you write at. Few fountain pens write this well. John Steinbeck wrote about this pencil, calling “the best he’s ever found.” Quincy Jones used it to correct his sheet music, Nabokov wrote with it–in lawn chairs and passenger seats while his wife, Vera, drove—and the creators of MadMen put it in the hands of the copywriters and the art department on that show. 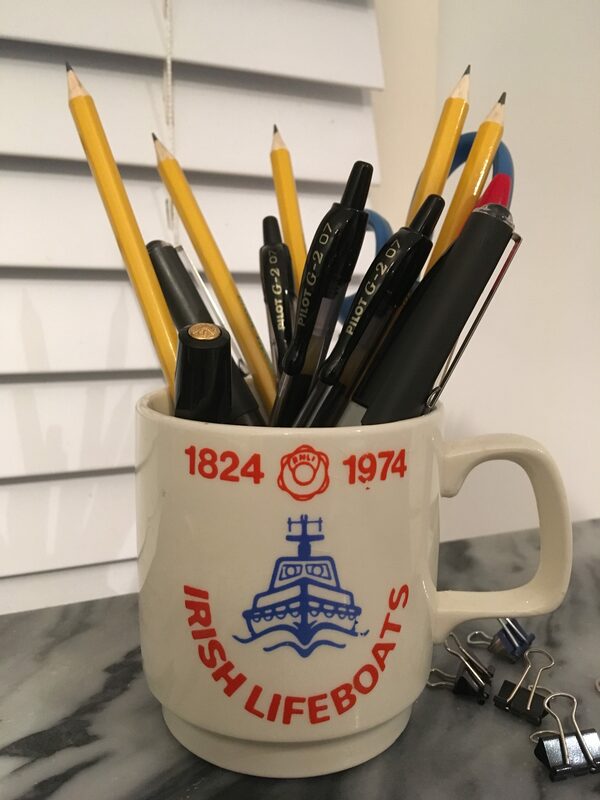 The cult following of this pen has a home online at BlackwingPages. 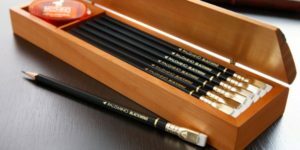 If you’re into fountain pens for the history and the heritage, the Blackwing delivers that in an erasable media. It was discontinued in 1998, but you can still buy it online. My fountain pen reviews have found an audience on Reddit where they’ve prompted a discussion that has been extremely educational for me. It blows my mind how much there is to know about pens and how civil pen people are talking about them online. In response to my review of the Kaweco Sport, one Redditor (/U/oyogen) pointed out an issue I forgot to mention about the pen. I had read about this in some negative reviews of the Sport. When I got mine home and inked it, I noticed that it was skipping on a glossy legal pad. When I switched to my Leuchturm notebook, it wrote fine. I was so stoked about my new pen that I forgot about the false start and attributed it to the paper. Having tested it on glossy paper again, I can say this is an issue with the Sport. 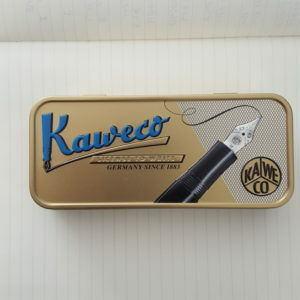 So, should this scare you off the Kaweco? It depends. 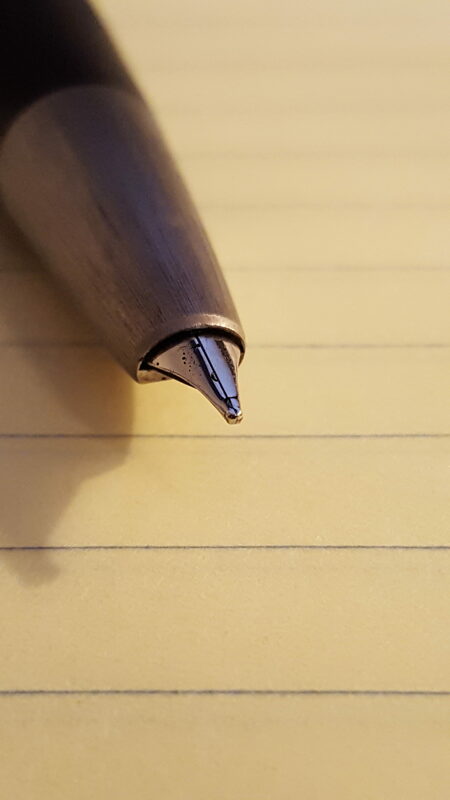 If you’re attached to one particular brand of paper, then you might want to test it and see if the nib agrees with your paper first. But if you’re not picky, this shouldn’t be a problem. You can always write on something different. As luck would have it, the paper that does work with this pen tends to be cheaper and more abundant. That’s right, FREE. Noodler’s gives away the Platinum Preppy with their inks. Alternatively, you can buy the Preppy on its own for $4.50 or a seven pack, in all the colors of the rainbow, for $16. As for my review, it’d be tempting to say “what do you want? 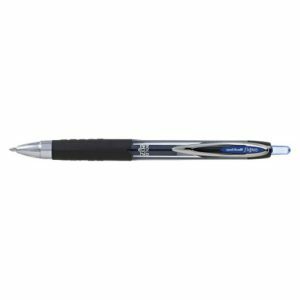 it’s a free pen.” But the fact is, this pen over-delivers in every way and outperforms most pens under $50. …is awesome. I’m gonna be controversial and say this writes better than everyone’s favorite budget pen, the Lamy Safari. But it costs five times less than the Lamy. 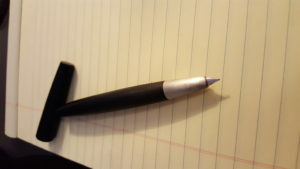 The nib isn’t overly springy but it doesn’t feel like writing with a nail either (cough cough –Safari–cough cough.) Like other Japanese nibs, this one lays down a fine line. There is an “05” (medium) option but that’s harder to come by. The default is a western fine. There’s no line variation whatsoever. So the preppy is not a budget option for fine writing. The barrel is covered in Japanese writing–at least on mine, which I bought in Japan–this is kind of fun, but it definitely marks it as a cheap pen. 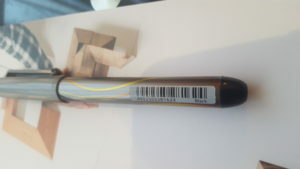 Like the Varsity, there’s a barcode on the barrel. On the plus side, the barrel is transparent, so you always know exactly how much ink you have left. 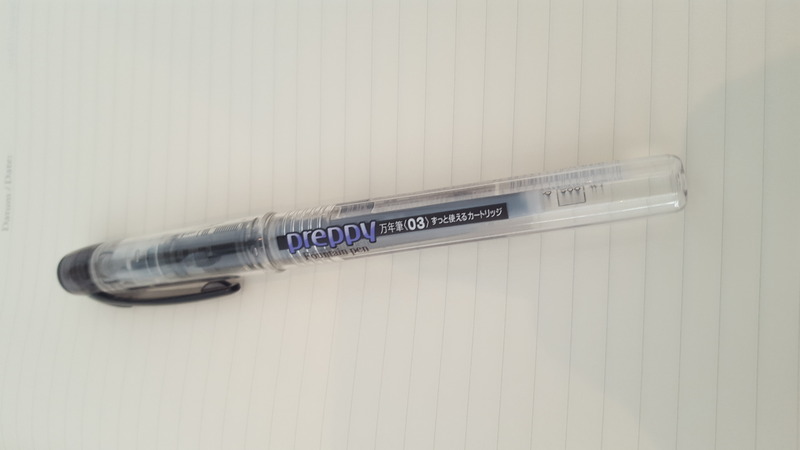 The best feature of this pen–the one I wish other manufacturers would copy–is the air-tight cap. I’ve picked up my Preppy after many months of neglect and disuse and the nib was still wet. This makes it no more temperamental than a ballpoint pen. The Preppy uses a proprietary cartridge that has a tiny metal ball in it. 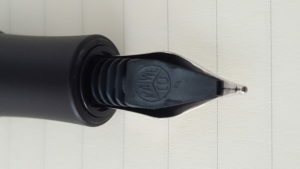 Not sure what that’s for, but it means This is to break the surface tension of the ink and improve the flow, but it means there’s a slight rattling in your pen. I haven’t tried the Noodler’s option, but the Heart of Darkness, that includes this pen, is one of the most praised inks out there. It’s made in the USA and it’s permanent. 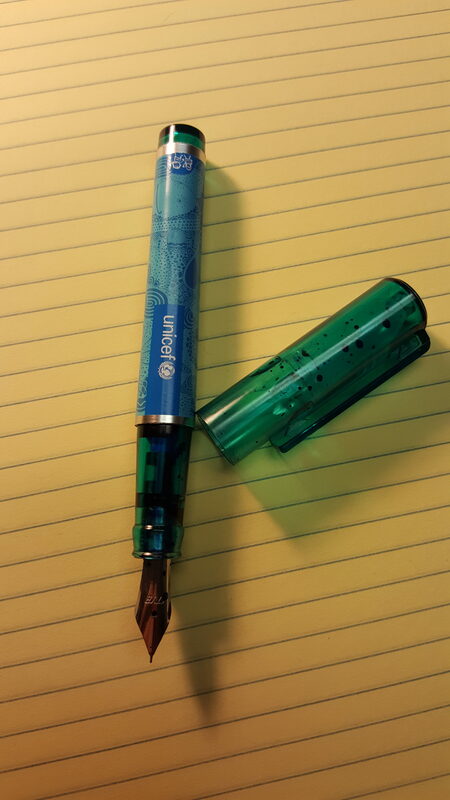 The coolest option is to convert your Preppy into an eyedropper pen. With a simple modification, you can fill the entire barrel with ink. Doing it this way gives you 2-3 times the capacity of a cartridge or or converter. The Noodler’s bottle comes with an eye dropper for just this purpose. 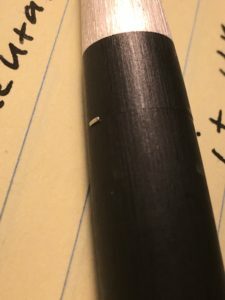 One of the best values in the fountain pen world is converting a Platinum Preppy fountain pen into an eyedropper pen, and here’s how. All you need is an o-ring and a bit of silicone grease, and a minute of your time. New to fountain pens? Start with the Preppy, it’s the perfect first pen. So into fountain pens that you don’t want to write with anything else? Make the Preppy your everyday beater, fill your cup with Preppys. Can’t justify an expensive pen but don’t like throwing your Varsities away? Get a preppy for $2 more. 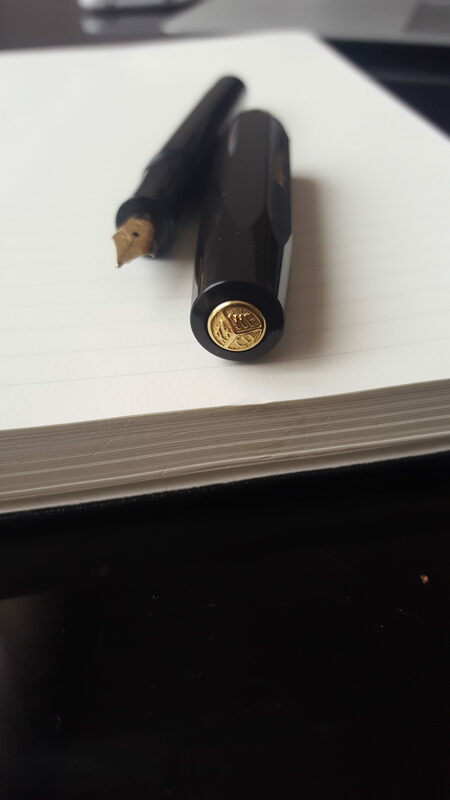 Gifting a fountain pen? Buy a dozen Preppies and give them to all your friends. That’s what I did when I was in Japan. 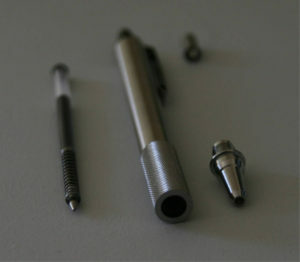 Want to modify your pen or covert it to an eyedropper? the Preppy’s price means your experiments will never be too costly if they go wrong. 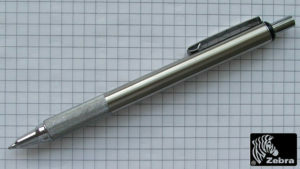 The Pilot Varsity is a disposable fountain pen. I have to keep reminding myself of that fact as I review it. I mean, it’s designed to end up in the trash. That said, the Varsity is not an awful writer. 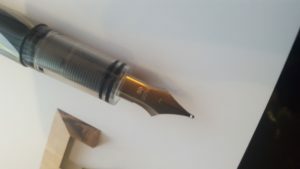 Pilot seems to have made up for the cheapness by designing a very tolerant nib. It’s basically a ball that allows you to write from just about any angle. This is probably helpful for a newbie who’s used to holding a ballpoint pen vertically. 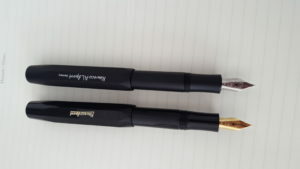 I’ve given these to friends who write with the nib upside-down (metal facing the page) with no trouble. 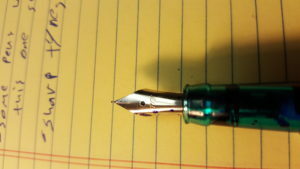 But a nib that doesn’t care which way you hold it doesn’t give you much of a writing experience. There’s no line variation even when you practically press it through the page. Based on feeling alone I don’t know that I could tell the difference between a Varsity and a gel pen. Not too bad, considering it has a barcode printed on the barrel. 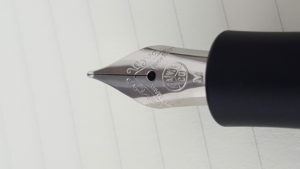 The lines are super clean and it’s much more balanced that the Pilot Metropolitan, which costs eight times as much. 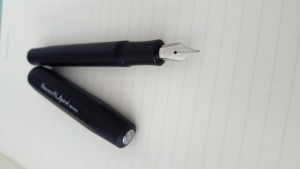 This feels like a fountain pen, not just a cheap pen with a nib at the business end of it, which is more than you can say for a lot of the more expensive models. I’ve owned a ton of these and I’ve never had one run out of ink. But then again, I’ve never been attached enough to write one dry. There’s a lot of ink in there, I know that much. Whether it’s enough to be cheaper than buying cartridges for a non-disposable pen–I doubt it. Someone who thinks $2 is expensive for a pen. Someone who refuses to use anything but a fountain pen, even for grocery lists and whatnot. 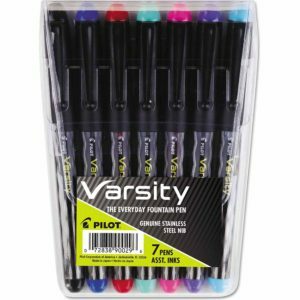 You can buy the Pilot Varsity in bulk. A seven-pack goes for $12 and a set of three is $8. You can find these at Rite Aid and Staples.